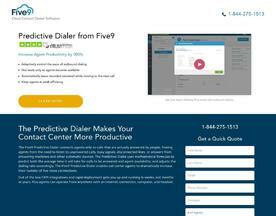 Online Predictive Dialer Software is an automated system for when telephones are used to make a high volume of outgoing calls, commonly by call centers and telemarketers. The way this software differs from an automatic dialer is that in order to maximize efficiency, a Online Predictive Dialer uses complex algorithms based on the number of available agents, the frequency with which calls are answered and other factors. The Online Predictive Dialer Software here is offered under the SaaS (Software as a Service) model, meaning that the software is web based, hosted on the Cloud and can be accessed when needed through a client or web browser. If you’re looking for similar online software like Online Predictive Dialer Software, consider our Call Center or Call Recording Software categories.